In July we introduced you to eight year-old tabby, Jandal (formally known as Tiger); the graceful lady whose collar wound meant that she needed a little TLC from the Frank Samways Veterinary Clinic before she could find her forever home. On a sunny Saturday afternoon in late July, Jandal caught the attention of Lynda, who came into The Lost Dogs’ Home after being persuaded by a friend. “I had been talking about getting a cat for a long time and a friend of mine suggested we visit the Home to look at the cats available for adoption. “It was important to me to adopt an older cat; my partner isn’t a big cat lover like I am, so we thought an older cat would be ideal as they are less excitable than younger cats and kittens. “When I first saw Jandal she gave off this what you see is what you get vibe, which I loved; I knew she was the cat I had been searching for,” said Lynda. 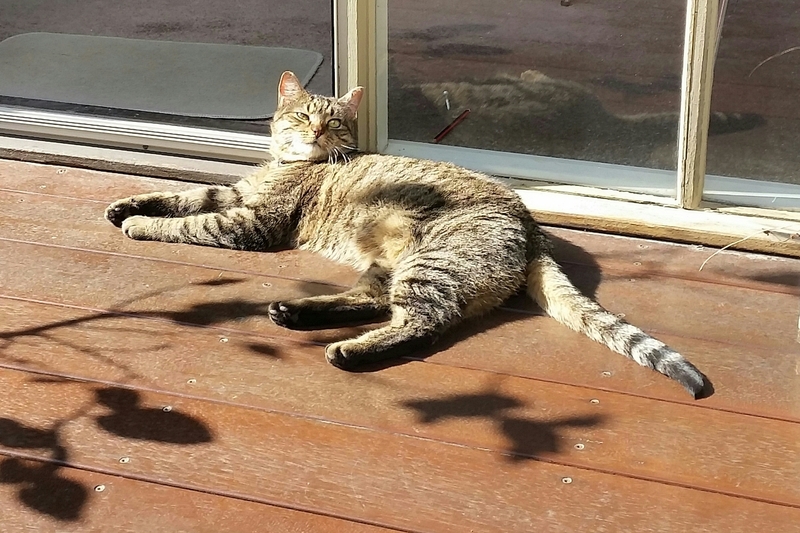 After taking Jandal home, Lynda soon found out that it wouldn’t take too long for this quiet and curious feline to settle into her home and her heart. “I was very impressed with how quickly Jandal settled into our home. 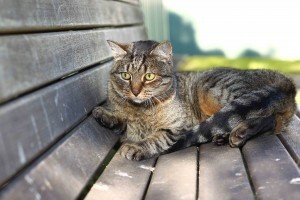 Sometimes cats can take a little while to become used to and comfortable with their new surroundings. But with Jandal, it only took her 15 minutes from the moment she arrived to become comfortable and familiar with her new surroundings. “I think the reason why she was able to settle in so quickly is because of her easy going personality; she is very happy to go with the flow,” explained Lynda. Now well and truly settled into her new home, Jandal is now happily passing the days away exploring her new surroundings and spending time with her new family. “Cats make great pets, they always keep you on your toes; you think you know them, but one day they will surprise you and reveal something about themselves you weren’t aware of. “For example I have had cats in the past who haven’t been keen to show you their tummy when they come to you for cuddles, but Jandal is so loving and affectionate that she has no problems turning over for a tummy rub, which really surprised me. “We absolutely love Jandal; she is an amazing little cat and we are so happy that she has come into our lives,” said Lynda.